A layer of smooth, creamy cheesecake sandwiched between layers of rich, moist chocolate cake covered in a luscious cream cheese frosting. A spectacular cake for a fun celebration. Have you had cake with a cheesecake layer in the middle? If you haven’t you’ve been missing out. Cheesecake Factory makes a Red Velvet Cheesecake Cake that is one of their most popular. My daughter saw Recipe Girl’s gorgeous Red Velvet Cheesecake Cake and asked if I would make a chocolate cake version for my grandson’s birthday party. I decided to use the Hershey’s Perfect Chocolate Cake that I adapted for high altitude and also adapted the cheesecake layer slightly for high altitude baking. 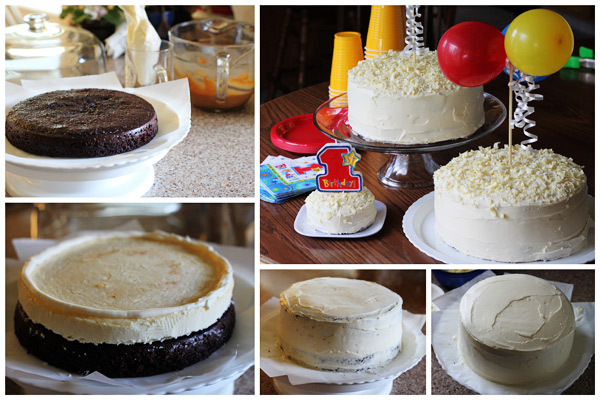 I used the high altitude baking guide in Chocolate Snowball and the tips on Elevated Kitchen for the cheesecake layer. My husband thought I should add a caramel layer on top of the cheesecake, but the caramel was too hard to cut through, so I’m omitting it from the recipe. I think next time I’d just drizzle a little caramel over the top or on the plate before serving. My daughter suggested using caramel ice cream topping. Dispite the problems I had with the caramel layer, this cake was fantastic. One of those desserts where you just can’t help but say mmmmmm while you’re eating it. In a large mixing bowl, beat the cream cheese with an electric mixer until it's smooth. Mix in sugar and salt and blend until it's creamy, stopping to scrape down sides of the bowl several times. Add eggs, one at a time, blending after each addition. Do not beat too much. Mix in sour cream, whipping cream and vanilla. Pour the batter into the prepared springform pan. Bake the cheesecake for 45 - 55 minutes. It should be set to the touch and not jiggly. Remove the cheesecake and let it cool on a wire rack for about 10-15 minutes, run a butter knife spatula around the edge to help prevent cracking. Cool for at least an hour, then place the pan into the freezer and let the cheesecake freeze completely. This can be done in several hours- or overnight. In a large mixing bowl, beat powdered sugar, cream cheese, butter and vanilla with an electric mixer until it's smooth. Remove the cheesecake from the freezer, take off the sides of the pan, and slide a knife under the parchment to remove the cheesecake from the pan. (I had to let my springform pan warm up a bit before it would open.) Peel off the parchment. Measure your cheesecake layer against the cake layers. If the cheesecake layer turns out to be a slightly larger round than your cake, move it to a cutting board and gently shave off some of the exterior of the cheesecake to get it to the same size as your cake layers. Place the cheesecake layer on top of the first cake layer. Place the 2nd cake layer on top of the cheesecake. Apply a crumb coat layer to the cake- use a long, thin spatula to cover the cake completely with a thin and even layer of frosting. Be sure to wipe off your spatula before you dip it back into the bowl to get more frosting (you don't want any crumbs to get into the bowl of frosting). When your cake has a thin layer of frosting all over it, place it into the refrigerator for 30 minutes to "set" the frosting. Once the first layer of frosting is set, apply the 2nd layer. Start by adding a large scoop of frosting onto the top of the cake. 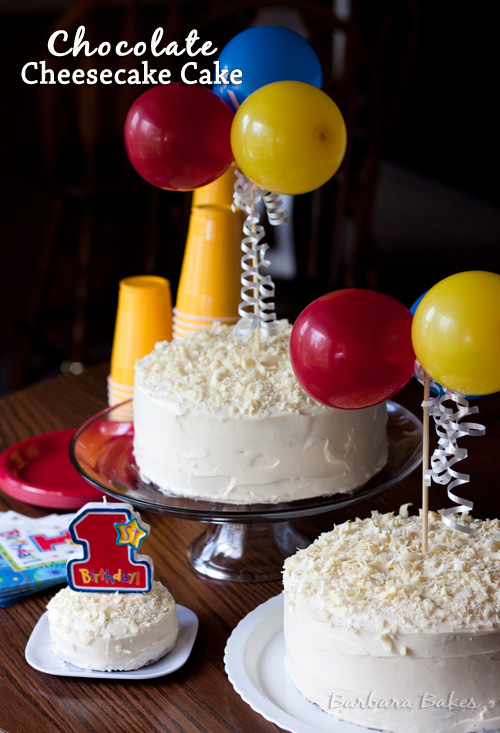 Use a long, thin spatula to spread the frosting evenly across the top and then spread it down the sides of the cake too. Keep cake refrigerated. I garnished the cake with shave white chocolate on top. I used a potato peeler and a bar of Ghirardelli White Chocolate. Your cakes look and probably taste wonderful. Do you have any gluten-free recipes for your cakes? I was diagnosed with Celiac diasease ten years ago and I have to adhere to a gluten-free diet. Thank you for the eye-candy? This sounds amazing and a little bit like a cake my daughter had at Cheesecake Factory. I love the combo of cake and cheesecake in a single cake. I do not know anything about high altitude baking though, nor how to convert a recipe from/to a high altitude recipe. I do not live at a high altitude, do you think I need to adjust the recipe accordingly? 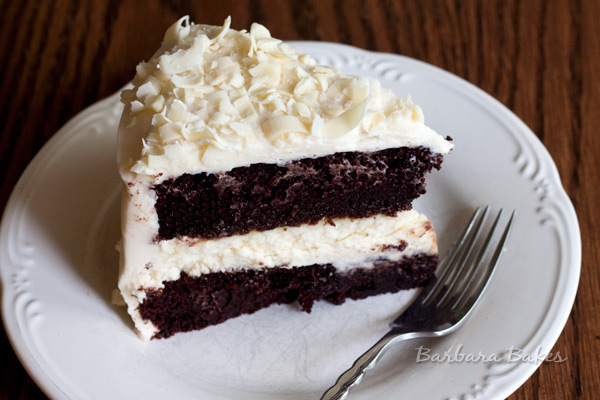 Ps – loved today’s recipe too with the chocolate cake and coconut filling – love that combo. Thank you, thank you!